A postcard depicting a (possibly Shilluk) woman and child standing in a homestead. Two of the visible structures have walls made from interweaving sticks, the whole hut raised on piles. Notes on postcard - "327 Copyright. G.N. Morhig, The English Pharmacy, Khartoum. 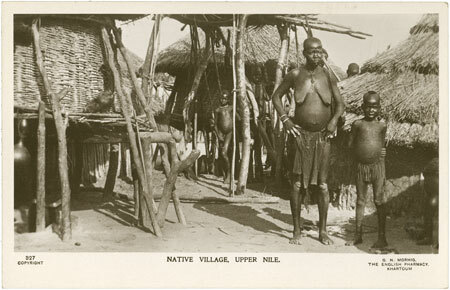 Native Village, Upper Nile"
Morton, Chris. "Homestead in Upper Nile" Southern Sudan Project (in development). 03 Jan. 2006. Pitt Rivers Museum. <http://southernsudan.prm.ox.ac.uk/details/1998.88.17/>.